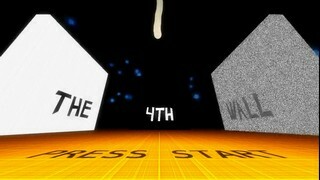 Released in August 2012, The 4th Wall is an indie adventure game that only has three walls. Best time: 0:02:58 by David Heidman Jr. on 2012-10-24. This game is rather straight forward. Fun fact though, this game only has three walls. Regardless. I go for the black wall first. Reason for this is how you enter the wall. You start the game closest to its entrance. In the next area, I luck manipulate the door to be the one strait in front of me. As I walk to it, I make myself look up so I can immediately begin in assent to the... orb thing? Second wall is the static wall. I go with this because it is the "hardest" wall to execute. This was the hardest thing to route as I am doing it more or less blind. You can see sort of but you need to be really close to a wall to see it. The way I routed it forces me to go in looking perpendicular to the wall on entry. If I am slightly off, it makes it a bit harder. And I have lost plenty of runs on this. Regardless, it is not all that hard being it is only a few moves. I take the same route out as I did in. So you can see the path I take. The white wall is saved for last. I do this because it is the easiest and never fails. This one did not take much planning, but getting the angle proper at the start is really hard. I use the grid on the floor but I always end up a bit off. It is weird. But looking in the orbs direction allows me to adjust and and get it before it finishes its turn back to center. Then it is just a waiting game. Shout outs to nate for the money he forks out to keeping SDA up and running and ad free, as well as to anyone else who donates to the site. I think nate needs more love than he gets.